We offer oil filters from giuliani anello, italy. These oil filters are made of aluminium as well as transparent bowl. The filters could be installed in any positions even if it is recommended to fit in vertical positions, with the bowl turned downwards in order to facilitate the separation of the water traces and the deposit of the filtered impurities. These filters are suitable for filtering a wide variety of oils to remove contaminants down to 100 microns and reduce maintenance costs. 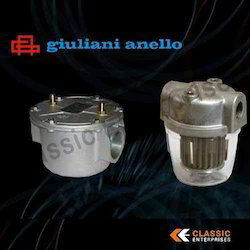 Classic Enterprises Dealers for Oil and Gas Burner Components from Giuliani Anello manufactures valves and filters utilized in heating applications mainly as Oil Burner Spares, Gas Burner Spares consists of strainer filters, Oil Filters, Gas Filters, Gas solenoid valves, Gas Pressure Regulating Valves , Gas Pressure Governor. Looking for Pressure Regulators and Filters ?